Welcome to Yoga Fest 2019! Jersey City HDSID and Jersey City Cultural Affairs to create the first ever Yoga Fest in Jersey City. Held during the weekend of the summer solstice in celebration of International Yoga Day, local yoga studios and instructors came together in the spirit of unity and oneness along with 500 yogis and several thousand onlookers and participated in a street event. Starting with a series of 108 sun salutations, it included meditation, music, and was headlined with a full vinyasa class lead by a well-known international yoga instructor. Over 30 vendor booths were installed at Grove Plaza with a large variety of offerings from henna tattoos to healthy beverages to a selection of yoga clothes, wellness items and related gear and yoga props. 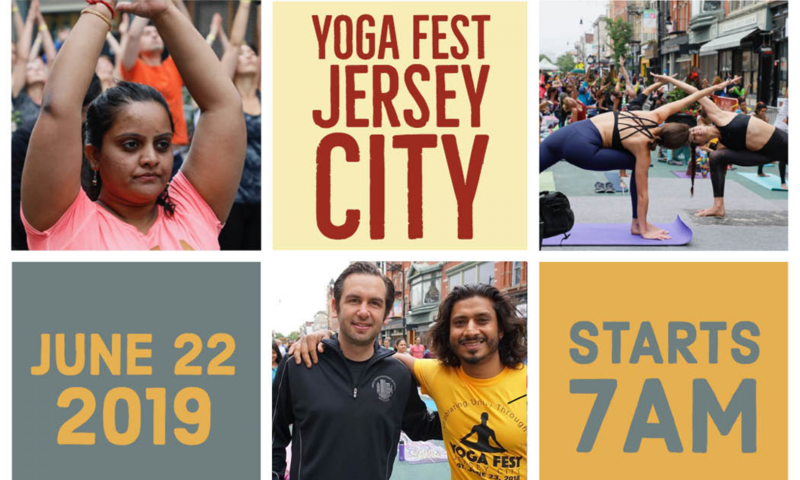 In 2019 Yoga Fest Jersey City is evolving and expanding into an event that will attract thousands of people from near and far. See all the entertainment acts here. An Additional Yoga Workshop will take place Sunday June 23 @11am at Jivamukti Yoga Center Jersey City with Yogeswari, a headline international yoga teacher and special musical guests. Learn more about Yogeswari here. Yoga Fest Jersey City is designed to Celebrate Unity Through Yoga in Jersey City as well as to establish Jersey City as a yoga destination. We believe it is possible to have everyone come together and work in harmony. Yoga is a positive force that can unify us all in a fragmented world. Jivamukti Center Jersey City and the Jersey City Historic Downtown Special Improvement District have teamed up to produce Yoga Fest Jersey City and VegFest NJ. Special thanks goes out to Jersey City’s Dept. of Cultural Affairs and the Mayor’s office for assisting in setting up and sponsoring this event. We have significantly expanded the event for 2019 with many new offerings and we believe that Jersey City will be a destination for yogis and like-minded people from around the world. Our corporate sponsors are vital to the success of this event. Without them, we would be unable to bring this dream to reality. Please support their businesses. Please contact us at info@yogafestjc for more information about the event.